Peels away blemishes. Firms and rejuvenates. A rejuvenating mask that unclogs pores, Himalaya Herbals Almond & Cucumber Peel-off Mask peels away blemishes and leaves you with healthy, firm and glowing skin. Almond nourishes, soothes and softens the skin. Cucumber tones your facial skin and provides a cooling effect. Pineapple removes impurities and dead cells, firming up the skin. Indian Gooseberry (Amla) has cleansing and antioxidant properties. 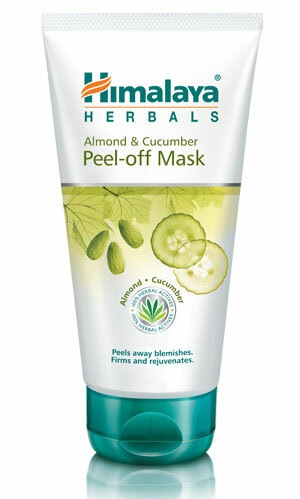 Apply Himalaya Herbals Almond & Cucumber Peel-off Mask evenly over cleansed face and neck, avoiding the area around the eyes. Allow mask to dry for 10-15 minutes. Gently remove the peel starting from the side of the face. Use once or twice a week. Do not apply on broken or inflamed skin.